Aomi anchored at Tamar Island in the Strait of Magellan with an anchor and a long rope tied to a tree. We often trust someone or something and think them reliable. With the conviction, we keep our business or friendship going. One day if you get in trouble and what you trust have disappeared, what would you do? In the Strait of Magellan, I was in fear and despair. 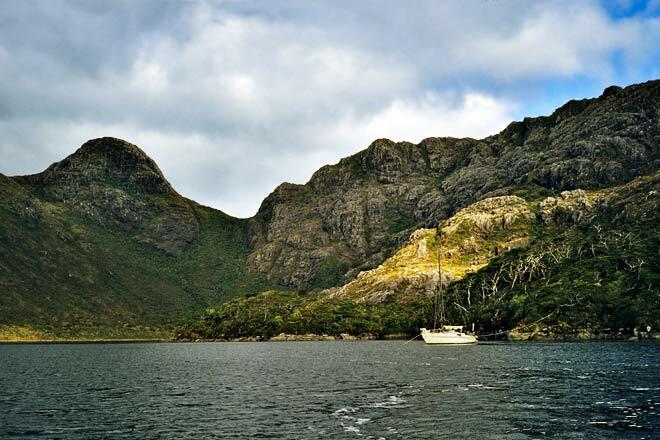 Aomi, sailing in the islands of Patagonia in Chile for more than two months, has reached the Strait of Magellan. Today's anchorage is in a bay of Tamar Island which is three to four kilometers in diameter and situated near the west end of the strait. In the reliable Sailing Directions issued by the U.S. Government, there is a warning about the bay, "The entrance is dangerous and should only be approached during periods of good visibility." The book also tells us that there is a cylindrical white beacon at the entrance. I found a symbol showing the beacon on a Nautical Charts as well. "No problem to find the safe course between rocks at the entrance of the bay, because there is a beacon," I talked to myself, keeping the heading toward Tamar Island. The Strait of Magellan is undoubtedly the sea of violent wind. The strong wind, coming from the Pacific Ocean, blows and inclines Aomi's mast toward the water while running with the smallest sail for storms. Around Aomi, steep triangle waves are standing up everywhere. Their peaks roll and break in green — not white —, blown by the violent wind, and fly on the water like bullets. Hail often comes from the dark sky of turbulent air. As the waves break one after another and cover the deck continuously, Aomi seems to be running underwater like a submarine. The wind is so strong that there are ripples on the water flowing on the deck. That must be the real face of the Strait of Magellan. Suddenly, a high wave has broken just beside Aomi. I crouch down in the cockpit at once. Though a mass of water has hit and washed me from head to toe, falling overboard is hardly avoided. After a while, the faint shape of Tamar Island, 424 m high, showed up ahead. There are many rocks at the entrance to the anchorage, but there is a cylindrical white beacon constructed on a rock. That will lead me to the anchorage safely. "By the way, where is the beacon?" I grumbled and grabbed the binoculars to search for a cylindrical white object while approaching the island. "Is there anything wrong? There is no beacon. Maybe It's gone, disappeared. The strong wind and waves of the strait must have washed it off! ", I grumbled again. The beacon showing the safe course has disappeared, though there are many dangerous rocks in front of Aomi. No way to proceed, but how can I go back in such a high wind blowing and pushing from the back? I just have to keep going forward anyway! The depth information around the bay is, unfortunately, scarce even on the most detailed nautical chart. I steer Aomi very carefully while finding the right course by confirming each rock around me with the chart. Passing through the water with white waves, and finding a course between rocks and kelp (giant seaweed), very cautiously, Aomi has entered the bay of Tamar Island at last. What I had seen there, at the cost of my life, was a big wall of rock. The scenery was like something which prohibits us from looking at it, or something to take one's thought away. I even felt like looking at God straight. It is something beyond human beings, possibly the life of the Earth, eternal time-and-space, coming directly into my mind. It may be true that I felt something beyond humans or the great spirit of the Earth, because of the extreme state of my life there. Do not rely on SINGLE human-made-navigational-aid including a light-house, a floating-aid, a Global-positioning-system (G.P.S.). They may become unavailable by war or natural disasters. Try to find your position at sea from several sources under the assumption that they may stop or collapse. Alternative plans for the emergency and a sense of crisis are necessary. At that time, Aomi was sailing near the west entrance of the Strait of Magellan. Let's review the Strait of Magellan. The strait crosses the southern tip of South America, Patagonia, from the east to west, connecting the Atlantic Ocean to Pacific. All the land south of the strait is a group of islands. They continue up to Cape Horn. 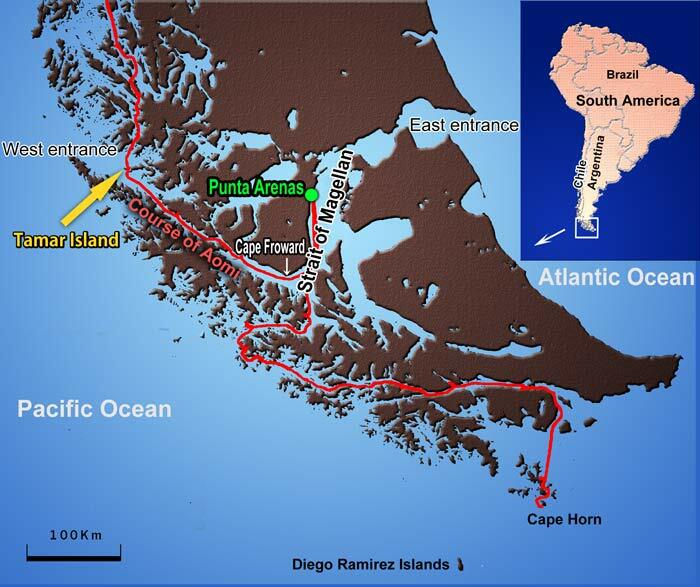 (Technically, the southernmost of South America is the Diego Ramírez Islands about 100 km SW of Cape Horn.) The red line above is the course of Aomi in the Chilean Archipelago. After sailing through the numerous islands of Chile for more than 2months, Aomi had entered in the strait and took a course to Tamar Island which was the anchorage for the night. Around Aomi, waves caused by the wind were mixed up with the waves coming from the Pacific, and the surface of the water looked very confused. Being covered with the waves which broke on the deck continuously, it was like going underwater in a submarine as mentioned above. The Strait of Magellan is indeed a place of severe wind. To enter the bay of Tamar Island, you have to sail between rocks. For safety, the Chilean Navy constructed the beacon at the entrance. By the way, what is the beacon at sea? I took these photos during the around-the-world navigation in Aomi. The beacon includes light-houses, buoys, radio-beacons. The one which appears in the episode above is a cylindrical white landmark, considered to be made of concrete. The entrance to the bay of Tamar Island is hard to find and dangerous because of the rocks around. "No worries, there is a beacon at the entrance which shows the right course," I talked to myself. The image below is a part of Chilean nautical chart 1105. You see the island indicated as "TAMAR" on the right side. The anchorage is marked with a red circle. To approach the anchorage, you have to pass through the entrance between dangerous rocks. The magnified image is on the left. Numerals on the chart show the depth of water in meters. The areas tinted in faint blue are shallow waters. Numerous black dots are rocks. The symbol which looks like seaweed shows Kelp (a kind of giant seaweed). The red line is the right course to the anchorage. The position of the beacon is printed on the chart with a symbol and pointed with a green arrow on the magnified image below. There are many rocks shown on the chart, and some of them might be hidden behind waves or underwater. There was a considerable chance to hit a rock, but the beacon had disappeared. I had to find the precise position of Aomi by checking the shape of the islands and rocks around me while watching slight changes in the waves which suggest hidden rocks underwater. That was a tight and fearful experience. After passing through the danger, Aomi arrived at the anchorage at last. There, I saw the scenery far beyond imagination. In front of Aomi, a spectacular wild cliff rose high. It is impossible to tell the experience in photos or writing. I surely felt the existence and its power of something beyond human beings. The fact, big rocks or mountains have been the object of worship, can be readily understood. The sunlight coming through the tiny hole in the cloud strikes the cliff, and the rock shines gold remarkably. The mysterious glow even runs on the rock every second. The above photo is taken in the same bay. Though Aomi is in the same position, the angle of the camera is 180° different. The mountain on the right appears to be a strange color owing to the faint spotlight of the sun. The rock shines gold or sometimes pink, depending on the situation. The black dots on the water are leaves of kelp which may wind around the propeller or anchors, that put a boat in danger. During the days in the Chilean archipelago, how many times I had seen such scenery! I felt like I was in the wonderland or dreamland. I was unable to think that anything happening around me was real. It is almost impossible to describe those experiences in photos or writing. I know that, of course, but can't suppress the emotion to tell YOU.